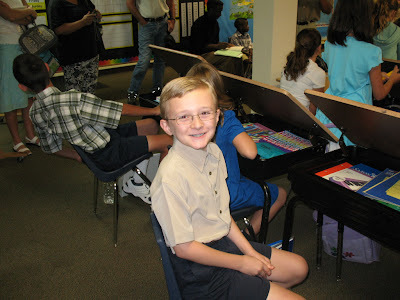 1st day of 4th grade - Is that boy excited or what? He had a great day and can't wait to get back tomorrow. To enjoy more photos, stop by Wordless Wednesday at 5 Minutes for Mom. such a sweet picture! My first reaction was "The desks hold themselves open now? No fair! I had to use my ruler to prop mine open all through grade school." Not only does he look excited, he looks so very happy, and soooo very handsome!!! Did a lot of parents show up to take pictures for the first day of school??? Looks like a dad in the background there...??? Just curious. It is always great to see how happy kids are on the first day of school. Sure looks like he has a lot of "stuff" in his desk. lisa... i have a 4th grader too, and he was totally psyched for school on monday! it's so nice when it's not a struggle! this is my first visit--nice work!